We are a not only a Verified Google Partner but also Certified Google Adwords Experts in the advanced setup and management of Google AdWords advertising campaigns known as PayPerClick (PPC) advertising. 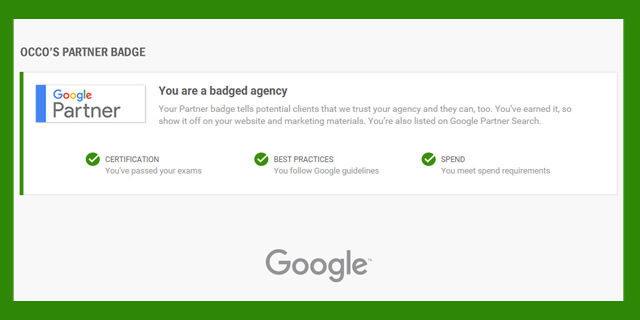 This means as a Google pay per click campaign management company, that we have passed 6 Google Certification exams, met campaign monthly spending requirements of over $10,000 per month, and proven to Google that we consistently adhere to Google’s strict “Best Practices” policies for high performance and customer care and we take that knowledge and use it to maximize the advertising success of our clients. How Does OCCO Do This? The way we do this is by providing comprehensive Google AdWords campaign setup and management services. The businesses of today know that it you must have an internet presence to be successful and there is no doubt that being listed on Google’s search engine is one of the most effective ways to achieve this success. 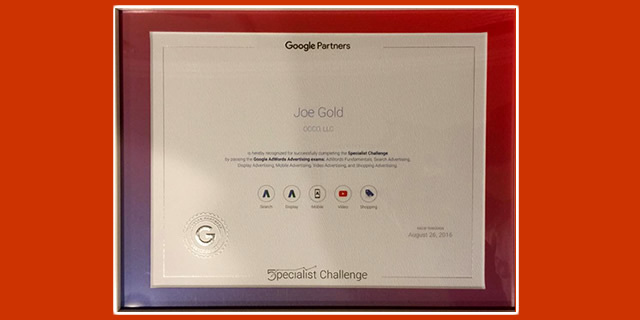 As certifed Google Adwords experts, OCCO’s use proven methodology to setup and management your pay-per-click campaigns. Want your business to appear higher in search engine rankings? Simply let us know how high and decide the amount of money you are willing to spend on pay-per-click to achieve that position. We will set up your pay-per-click account for you and provide top-notch management, placing appropriate bids so you can attain the best search engine results possible! At OCCO we provide expert management for pay-per-click marketing campaigns. Whether you are willing to use one pay-per-click company or multiple, we can set up your marketing campaign and run it for you. We will monitor your bids frequently and perform continuous analysis of your marketing strategy to ensure you make the most of your marketing budget. The ever-changing auction environment is something most businesses fail to keep up with. However, with our pay-per-click bid management, we will gladly take care of that for you! Simply let us know the amount of your maximum bid and we will hand everything from there onwards. Convenient, isn’t it? With pay-per-click search engine marketing, you can bid for higher positions in the search engine rankings. When your specified keywords are used by somebody to perform a search, your website appears in a list featuring other websites that use the same keywords. You pay the search engine every time your website is clicked on by a visitor. If you want to run the best pay-per-click campaign, professional management is essential and at OCCO, we take pride in offering this service. To ensure your marketing dollars are put to best use, we monitor your PPC accounts up to 24 times in a single day! Moreover, we will notify you if there is room for improvement in your PPC campaign, even if it’s the slightest, so you can make a well-informed decision accordingly. That’s not all though. We are always one step ahead in placing your bids, ensuring you secure the best search engine ranking for your website. PPC advertising, when done correctly, gives businesses the perfect opportunity to secure the highest positions in the search engine rankings. However, let’s face it: not everyone knows how to run PPC advertising! At OCCO, we offer complete bid management and monitoring, giving you more time to focus on your customers. Having trouble managing your PPC campaign? Nothing to worry about, as we offer professional and constant PPC campaign management that will ensure you are in the best possible position to gain optimal results! We analyze the progress of your campaign and if there is room for improvement, we will provide you our expert suggestions to improve it further. Best of all, the progress of your campaign is monitored by us constantly, allowing us to provide you monthly reports so you can see exactly how your campaign is doing. OCCO provides comprehensive help for PPC campaigns. From setting up your PPC accounts to monitoring them, we can give you a helping hand in your time of need. Not only this, we have the capability to offer a detailed analysis of your PPC campaign and can offer expert guidance and advice regarding how its effectiveness can be improved further. Our team of Google Awords experts offer unparalleled monitoring for your PPC accounts. We keep a close eye on their progress by checking them as many as 24 times a day! With frequent monitoring like this, we are able to stay up-to-date about the ever-changing bids for the highest positions in the search engine rankings. If the ranking of your website is threatened, we can help you protect it courtesy of our frequent monitoring. It doesn’t matter what type of company you are, we take great pride in providing PPC management services for all! We are here to help take the guesswork out of establishing and managing your PPC campaign. Through us, you have access to all of our PPC management services, which include account creation and analysis as well as monitoring. Don’t Wait Any Longer, let the OCCO team of Google Adwords experts put the power of Google Pay Per Click advertising to use for your business today!